Warning:- This method is only for device owner, not for any thief person. Note:- We try this method on Samsung SM-J530F/Ds, you can also try this method on any other Samsung J5 pro device. follow this method to successfully Bypass Google Account J5 Pro. -Now we need to enable “talkback” to successfully Bypass Google Account J5 Pro. -Press the home key “3” times quickly, and you have to wait 15sec then you will have “talkback screen” on your device. -After that, draw “L” on your talkback tutorial screen with your finger to bring the “Global Context menu”. -After this, tap on the “Get started with the voice access” to successfully Bypass Google Account Samsung J5 Pro. -Then long press and drag down the Video. -Now it will redirect to Samsung browser. -Then tap on the “accept & continue”. Note:- In this we show to apk, following this process you need only one apk to Bypass FRP Samsung J5 pro. -After that, swipe down and download the below 2 apk files. -After that, tap on the “Bookmarks” from your browser button bar, then a “Samsung” sign in popup will come press “cancel” from there. -Then tap on “History” from there, and then tap on “Download” history. -Then there you will see your all “2” downloaded apk files. -Enable “Unknown Source” from there. -Tap on back key and tap and install “Quick Shortcut Maker” once installed then tap on “Open”. -Now you have successfully accessed “Quick Shortcut Maker”. -After that, tap on the “Application menu” from the top bar to Bypass Google Account Samsung J5 Pro. -Now then type “Settings” from there. -Now it will redirect you to the “Settings” menu. -Then go down and tap on the “Biometrics and Security”. -Once again go down and tap on the “Other Security Options”. -Tap on the “Device Admin Apps” -> Find my device -> Deactivate. -Now go back to settings main menu by tap back key 2-3 key. -Now we have to disable some applications to successfully Bypass FRP Samsung J5 Pro. -Then tap on the “APPS’ from settings main menu. -After that, tap on “3” dots from the top right corner then tap on the “Show Systems”. -Now find and tap on the “Google Play services” and then tap on “Disable”. -Once done, tap on the back key to back on the App list. -Then find and tap on the “Google Services Framework” and then tap on the “Disable” button. -Tap on the back key “4-5” times to go “Download” folder. -Then you will see “Google Play Services” that you downloaded before. -Then tap on the “Google Play Services” and then install it, once installation finished then tap on “Done”. -Once again install “Quick Shortcut Maker” from that list, then tap on “Open”. -Then tap on the “Applications” from the top bar of “Quick Shortcut maker”. -Type once again “Settings” there. -Then results will come then tap on the “Settings” and then tap on “try”. -Now go to “Cloud & Accounts” then “Account” -> Add Account -> Google. -Then you will have “just wait” screen in your device. -Once you sign in successfully just tap next and -> agree. -After that, you will have “Force stopped” popup in your device just ignore that, then go back to settings main menu by tapping back key. -Tap on the “Device Admin Apps” -> Find my device -> activate both Find My devices options. -Once Power on your device. -Complete the initial setup your device. -Then go to the “settings” -> About device-> tap on build number 7 times to enable “Developer Options”. -After that, go back to settings. -Tap on “Developer Options” then enable OEM and USB Debugging mode from there. -Once done, Go back to the settings -> General Management -> Reset -> Factory Data Reset -> Reset-> Delete all. 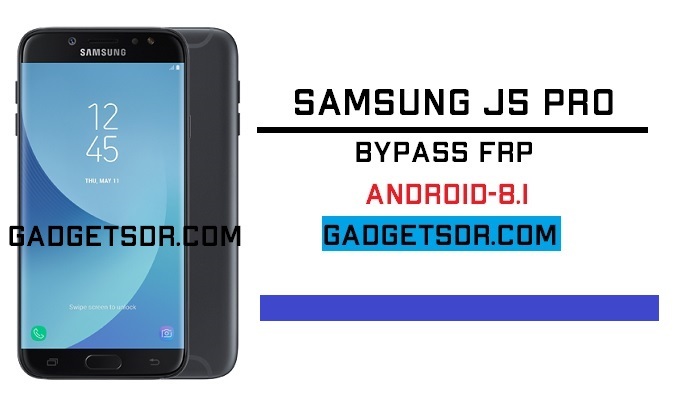 Congrats now you have successfully Bypass FRP Samsung J5 Pro. Thanks for visiting us, Comment below if you face any problem With Bypass Google Account Samsung J5 Pro – Android-8.0, we will try to solve your problem as soon as possible. you can check other some tutorial here to help you.